How quickly can bed bugs spread? 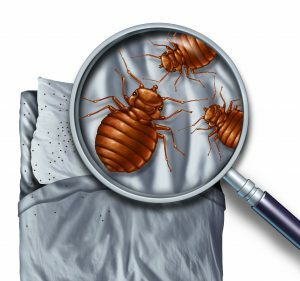 Bed bugs are one of the worst pests! They thrive by sucking blood from human hosts. They are nocturnal creatures which mean that they feast on our blood when we sleep. Even though they can’t pass serious disease to humans, their bites and their presence, in general, can lead to allergic reactions. In addition, their bites also cause itching similar to the one experienced after a mosquito bite. Bed bugs are very difficult to detect and they can survive for weeks without eating. If there is bed bug infestation, homeowners must look for professional help. But, how quickly can bed bugs spread? When it comes to the outdoors, these bugs often infest nests made by bats, birds, and other animals. Bed bugs are about ¼ inches long which means that they can easily penetrate our homes. They can also enter hotels, guest houses, and apartment buildings. When they find a suitable spot for a living they start procreating. This reproduction process is very quick. A female bed bug can lay up to five small eggs in one day. Their hatchlings have a size similar to a poppy seed. When they finally hatch, the new bed bugs need just one “portion” of blood to enter their next phase of development. After about one month, bed bugs reach maturity which means that they can start procreating too. On average, one female bed bug can create a second generation of bugs that number nearly 200 bugs. These pests can easily spread from one area to another. They use the cracks and holes in the ceilings, walls, and floors and they go through windows and door frames. It is not uncommon to find them in recesses and cracks where they usually lay eggs. If you find bed bugs in your home, it is a smart idea to talk to a professional right away. Give us a call and we’ll arrange an inspection and advise you on the best solution.